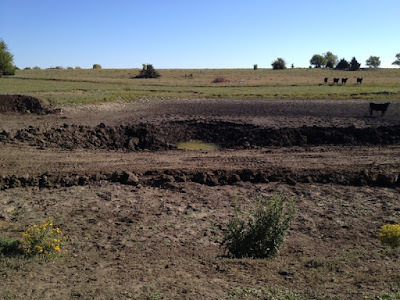 During the drought of 2012, eastern Kansas was hit hard--and is still suffering! We all hope for rains this fall and winter (and even snow) to make up the precipitation deficit. In the meantime, we are using the dry season to do repairs on some ponds. 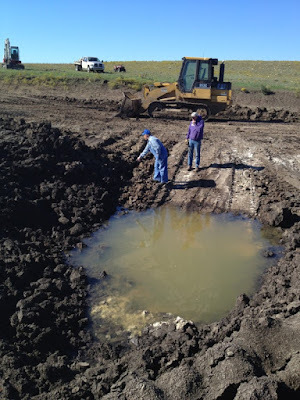 Farm ponds become filled in with eroded dirt called "silt" over the years. It has been about 50 years since this one was dry and could be dug out. You can see that the silt is more than 6 feet deep in the middle of the pond. My husband, in purple, and the pond specialist (fancy term, eh?) are looking at the silt, as the water seeps back in to the pond. This pond is spring-fed and will hopefully refill quickly after the silt has been removed. The heifers in the pasture are sneaking in for a look at the progress! The tractor driver, I mean pond specialist, said they come back every hour or so to peek over the dam and watch him for a bit! So then what do you do with the silt you've pulled out of the pond? If you left it around the edges on the pond, wouldn't it just be pulled back into the pond as the rains come? 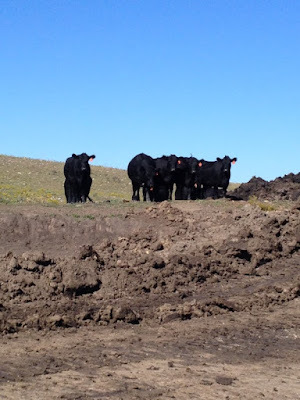 Does the "pond specialist" spread it out on the surrounding pasture? Good question! The silt is usually used to reinforce the dam...which is downstream so it won't get pulled back in. Also, it often is very good dirt, so can be used as topsoil in a yard or other landscaping. I suppose it could be spread, but would cost more than it saved.